We spent ages with our markers and paper drawing out very elaborate plans for how to get pumpkins, we were so busy we didn’t even notice that Mummy had gone to the shop. Until she came back with TWO pumpkins! We got one each!!! I decided to call mine Pumpky (for some reason Mummy didn’t seem too impressed at my naming skills) and Ted decided to call his one Orangey. We kept our pumpkins for a few days before we were told that we had to decide what to do with them. Apparently most pumpkins get either chopped up and made into soup or carved up and get made into lanterns. Both of those options sounded a bit painful, I didn’t think that Pumpky would like to be chopped or carved. I asked my parents for advice because they’re really old and I heard that makes you wise. I’m not convinced… They gave me a long talk about why pumpkins are grown and how they have to fulfil their Halloween destiny if they’re going to be happy. We decided to carve them because otherwise we might have to eat soup and that’s made of vegetables. 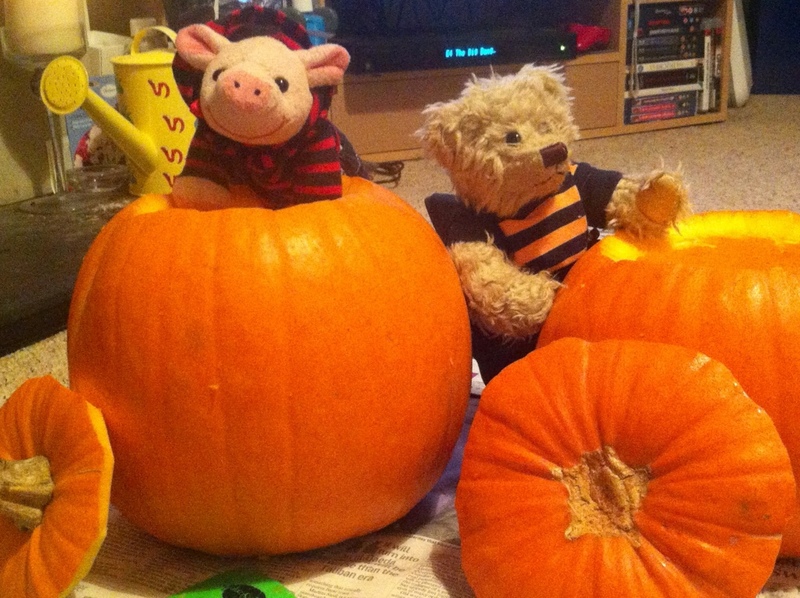 We’re too small to be allowed to handle knives so Mummy and Daddy cut the tops off the pumpkins so that we could get working. 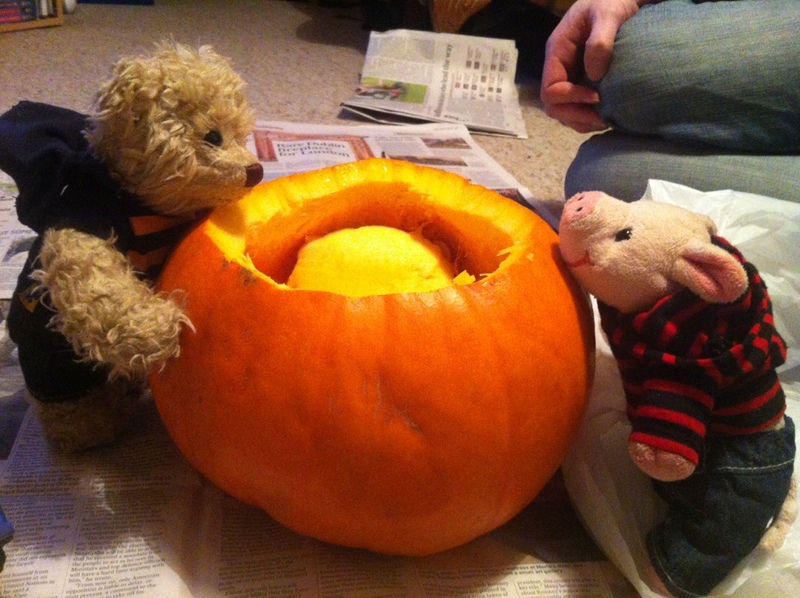 The next bit was really icky, it turns out that the insides of pumpkins are really gooey and messy. There are lots of seeds in pumpkins. Daddy helped me to take them all outside to plant them in the flowerbed, hopefully next year we’ll have hundreds of pumpkins in the garden! It was really fun pulling all the insides out, the only problem was that I got so dirty I had to wash my face and hands after 🙁 Once the pumpkins were clean, we picked out what designs we wanted. 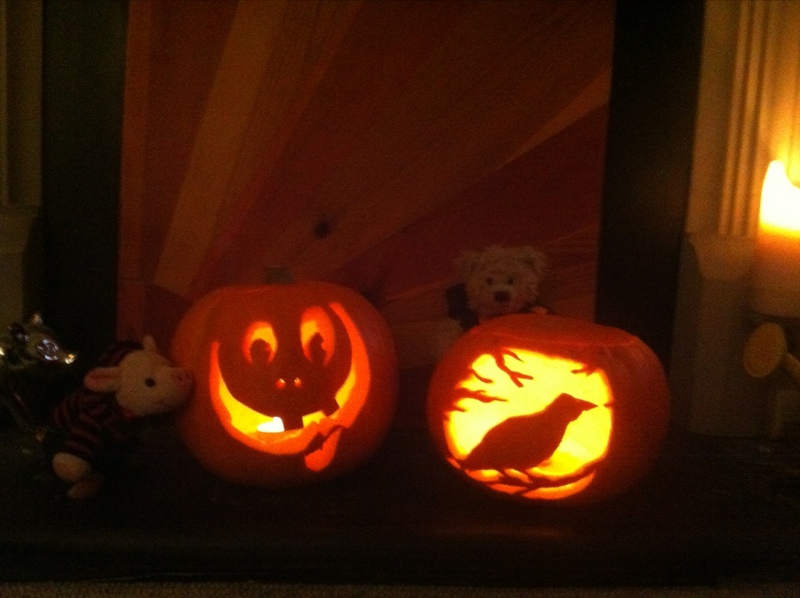 I picked a big smiley face for Pumpky and Ted picked a bird for his. Then the hard work started, we had little saws to carve out the pictures. So difficult! 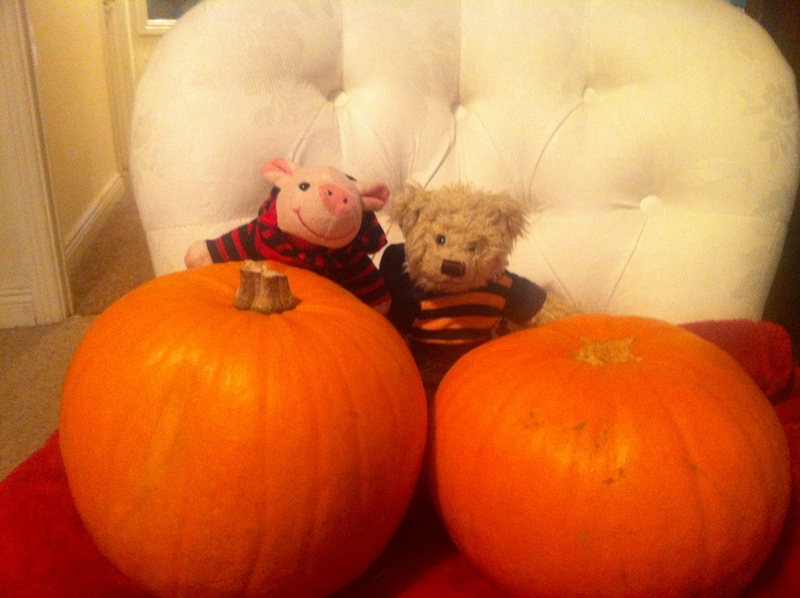 So Pumpky and Orangey have fulfilled their Halloween destiny, they look amazing! We put candles inside them to keep their insides warm. I tried to climb inside but Mummy said I’d need a full bath if I did that so I decided to just sit and watch it for the evening instead. Hurray for pumpkin time! 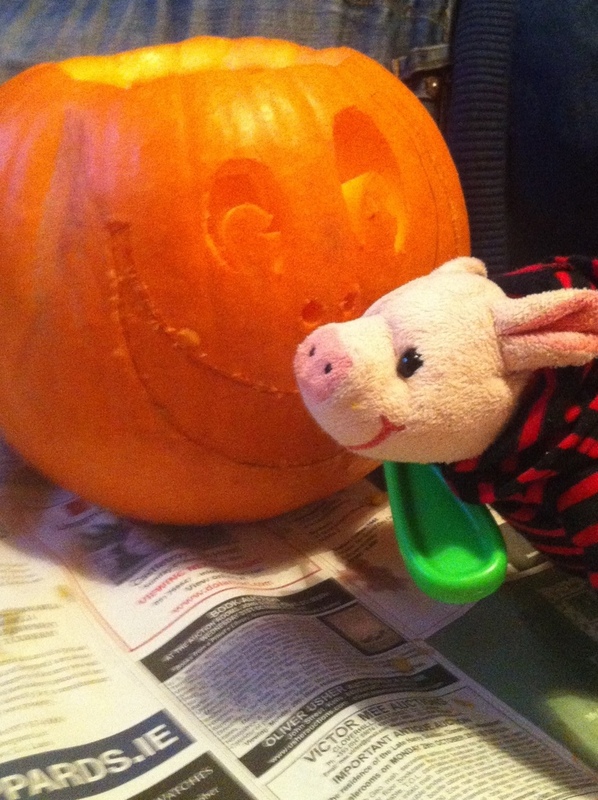 This entry was posted in Uncategorized and tagged Halloween, Pumpkin, ted and oink. Bookmark the permalink.